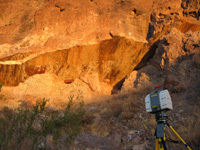 The LIDAR instrument (foreground) scans an exposed fault in Dixie Valley, Nevada, measuring its topography in great detail. Photo by E. Brodsky. Old earthquake faults appear to be smoother than young ones, worn smooth over time by friction like the brake pads of an old car. That's one of the most striking insights of a new study by geologists at the University of California, Santa Cruz. Published in the March 2007 issue of Geology, the study shows the structure of mature faults differs significantly from that of young faults. Emily Brodsky, assistant professor of Earth and planetary sciences, and postdoctoral researcher Amir Sagy used a new tool to create extraordinarily detailed topographical maps of the vertical sides of exposed fault lines. Their findings suggest that the age of a fault may influence the nature of the earthquakes it generates. The idea that old and young faults have fundamentally different structures is not new. In fact, the idea that faults evolve has been around a long time. But fault structure is very difficult to measure quantitatively, Brodsky said. "They're all relatively smooth surfaces. Therefore, what you're looking for are relatively subtle differences between the mature and immature faults. To do that you need a really good tool," she said. Brodsky found that really good tool in laser imaging detection and ranging (LIDAR), a technology that has emerged in the last three years. Like radar, LIDAR sends out a pulse of energy and then records information from the reflections that bounce back to it. Rather than using radio waves, as radar does, LIDAR uses pulses of high-energy light, making it more sensitive than radar. Earlier geologists studying the structures of faults had to rely on measuring cliff profiles with tape measures and metal bars. Often, this entailed climbing around on sheer rock faces in rappelling gear for hours to collect a very few measurements. "That's really hard to do. You work all day and you get ten data points measured. We sit there for about an hour with our equipment and we get about a million data points," Brodsky said. LIDAR scans enormous rock faces from the ground, taking a data point as frequently as every three millimeters. The LIDAR machine, which looks like an oversized computer printer perched atop a yellow tripod, folds up to fit in a large crate for transport. Because the LIDAR machine is not exactly handheld (it weighs 50 pounds), Brodsky and Sagy had to be choosy about the faults they measured. Sagy researched faults from Santa Cruz and then went on road trips to scan them. He looked for faults that were easily measured, with significant amounts of rock bare above the surface. "I would connect with geologists who had found beautiful faults," Sagy said. "It had to be a relatively large surface, larger than two square meters. But it also needed to be a place that was easy to get to by car." In the end, it took Sagy almost two years to collect and analyze the data for approximately 15 sites in southern California, Oregon, Nevada, and Utah. Both Sagy and Brodsky say the results clearly show that, on a small scale, older faults are smoother than young faults. Although mature faults tend to be smooth at small scales, the study also found that they have regular features on larger scales. They're like gravel roads over which countless cars have driven: The gravel has been pounded down into a semblance of smoothness, but a washboard pattern has emerged. Younger faults tend to be rough on all scales with no discernible patterns, like a new gravel road with rocks poking at all angles. "The thing that was really surprising was that the mature faults have a really distinct structure, little hills on them, at the 10 meter scale. That's very surprising, because most geologists thought they were fractal," Brodsky said. Fault lines have been cited as examples of fractal geometry, exhibiting the same structure and complexity regardless of the scale of observation. Sagy said an earlier study on this question by other scientists hadn't found evidence to support the idea that fault lines are fractal, but the researchers had chalked up their failure to inadequate equipment. Now, however, their findings have been confirmed by the more powerful LIDAR technique. "Their data suggested that it wasn't fractal, but they thought it was the fault of their instrument," Sagy said. "In fact, they were right from the beginning." Because the two types of faults are so different, Brodsky says, everything about the earthquakes these faults produce should be different: their birth, strength, and propagation. What these differences are and how they occur still isn't clear. Brodsky and Sagy hope to use their new knowledge of faults to study how a fault's structure affects the earthquakes it generates. "We don't know how the amount of shaking from the same size earthquake acts on different kinds of faults. It could be that the smoother, mature faults give you a less bumpy ride," Brodsky said. "The next step is to work out what these predictions mean for earthquakes." Sagy and Brodsky collaborated with Gary J. Axen at the New Mexico Institute of Mining and Technology in Socorro, New Mexico. The research was funded in part by the National Science Foundation and the Southern California Earthquake Center. Note to reporters: You may contact Emily Brodsky at (831) 459-1854 or brodsky@es.ucsc.edu. You may contact Amir Sagy at asagy@pmc.ucsc.edu.